Metro will ink renewed contracts to haul much of region's garbage, by truck, to Eastern Oregon landfill. Metro is going with the status quo in awarding new contracts to dispose of the Portland area's garbage. 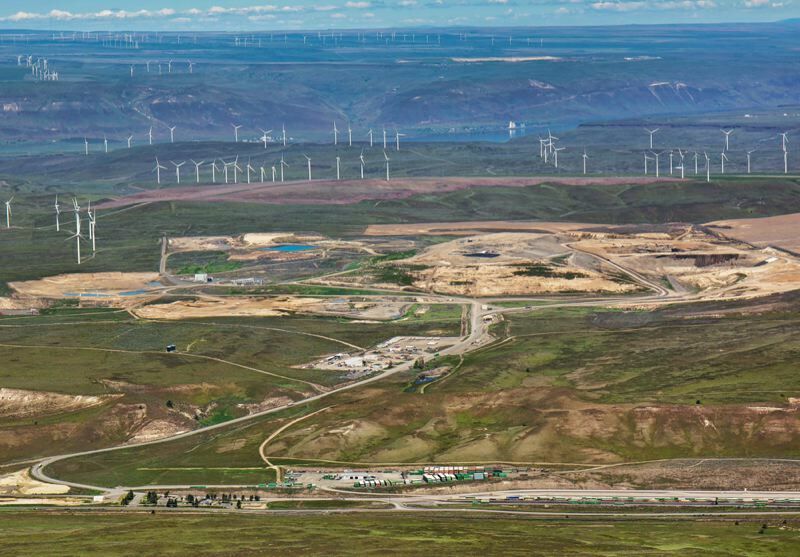 The regional government announced Tuesday it will ink a 10-year contract to bury garbage collected at two Metro transfer centers at the Columbia Ridge Landfill near Arlington in Eastern Oregon. The landfill is owned by Waste Management. Metro also will sign a 10-year contract with Walsh Trucking Co. to haul that garbage on the 150-mile daily trek to the landfill. Metro has the option of extending both contracts for five or 10 years. Both deals essentially retain the current service providers. Metro has contracted with Waste Management to bury the region's garbage in the Arlington landfill since 1990. It has contracted with Walsh for garbage hauling since 2009, said Ken Ray, Metro spokesman for solid waste. "After a highly competitive process, we chose two companies that are experienced in managing and transporting garbage and are well-positioned to provide good service," said Paul Slyman, Metro's director of property and environmental services, in a news item written by Metro staff and posted on its website. "We believe we've done right by the Portland area's ratepayers and the environment," Slyman said. Both contracts take effect in January 2020, when the current contracts expire. The big difference in the renewed contracts will be the sharply reduced quantity of garbage. Metro currently manages 1.3 million tons of garbage a year for the Portland area, sending about 90 percent of it to Columbia Ridge. But several years ago, a U.S. Supreme Court decision reduced Metro's "flow control" of the region's garbage. That decision granted control of the garbage to the owners of the transfer centers where neighborhood and commercial haulers stow the garbage. For the new contracts, Metro is only committing to send roughly 500,000 tons a year, the current amount shipped from the Metro-owned Central and South transfer centers. That will require about 60 long-haul trucks per day to ship the garbage to Columbia Ridge. Under the court decision, garbage sent to the five privately owned transfer centers in the region now is controlled by the owners of those facilities, who are free to contract with whichever landfill and hauling company they prefer, starting in 2020. Metro announced that it secured a lower rate per ton to dispose of garbage in Columbia Ridge than under the current deal. The private transfer stations may, under certain circumstances, piggy-back on that reduced rate. Metro won't yet disclose that rate, though Ray said the landfill contract will be valued at about $110 million and the trucking contract will be valued at about the same amount. It's presumed that garbage from the privately owned transfer centers in Forest Grove and Troutdale will continue to get sent to Columbia Ridge, as they are owned by Waste Management. The owner of the Wilsonville transfer center, Republic Services, is expected to send its garbage to its landfill in Washington. The other two landfills, in Sherwood and Gresham, are owned by families. The reduced rate secured by Metro was expected, because of greater competition in the landfill business. When Columbia Ridge opened, it pretty much had the regional landfill market to itself. Since then, its competitors have opened landfills. Waste Management won out over three other bidders, Metro reported: the Finley Buttes Landfill near Boardman, owned by Waste Connections; Roosevelt Regional Landfill in Roosevelt, Wash., owned by Republic Services; and Wasco County Landfill near The Dalles, also owned by Waste Connections. Walsh also won out over three other bidders: Washington-based trucking company LTI, Inc.; Tidewater Barge Lines, which proposed barging garbage up the Columbia River instead of trucking it; and Union Pacific Railroad along with Waste Management, which proposed sending waste to Columbia Ridge via trains.